Flood's mob: Wyatt claims there were 300 in the mob and they were coming at a run. He describes the scene of the mob armed "with picks and shovels were in their hands, and rifles and shotguns and long bars; implements that they had seized in hate, weapons that would kill and maim." He compares the scene to the French Revolution (that's probably Flood). And then Wyatt is alone facing the mob and "The venom of reptiles, the malice and the envy of bitter men, the wild, delerious [sic] frenzy of fanatics, the will of hate and vengeance fixed itself in the faces, almost adamantine, of the standing horde." Burns' mob: "brutes stirring to fury, the note of menace unmistakable." Lake's mob: "every man had a shotgun, rifle or six-gun, ready to pour lead into the lone peace officer." This is from James Covington Hancock, who was in Tombstone on the day of the stand-off and after Burns' book came out (Hancock was interviewed by Burns for the book), he, Hancock, claimed that the so-called lynch mob, was nothing more than "a bunch of 'rubber necks'—I was one of them myself—no one was armed and there was no demonstration of any kind." Lest you think Hancock was a ne'er do well Earp-hater and cowboy lover, Mr. Hancock served as a customs collector, justice of the peace, school board member and postmaster of Paradise, Arizona. Daily Whip Out: "The Doctor Will See You Now. . .At The O.K. Corral"
Alternative title: "Let Them Have It! The Two Who Started The Fight, Doc and Morgan." "There isn't any blue like it anywhere, the great, blue sky of old Tucson: that bends above it and hems it in 'round about." 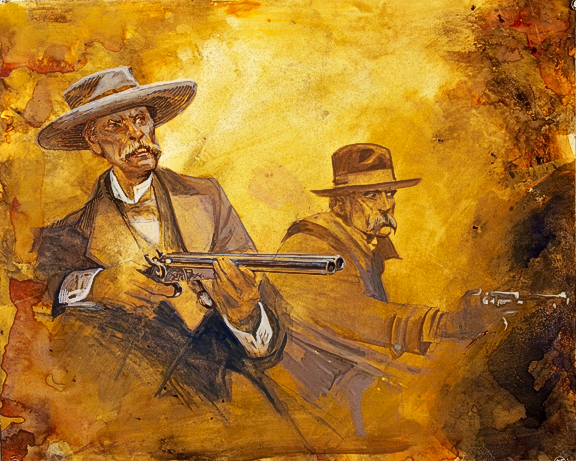 "Its sky of blue and its sunshiny sun; and Wyatt Earp stood beneath it, and he loved it, and the sands that blew upon him, in the daytime and when the stars were out." "In my opinion Mr. Burns must have been well paid by Wyatt Earp for writing this book judging by the way he toadies to them. . .it is to be regretted that as brilliant a writer as Mr. Burns is that he would stoop to such a dirty trick for a few dollars."